The Kirklees MMO Movement and Dance in Chairs was launched on Monday 4th March at The Legends Café Bar at The Johns Smith’s Stadium, Huddersfield. Movement and Dance in Chairs is a sociable, fun, interactive session to improve mobility. Open to all but ideal for older people, those who are less mobile or have memory challenges. 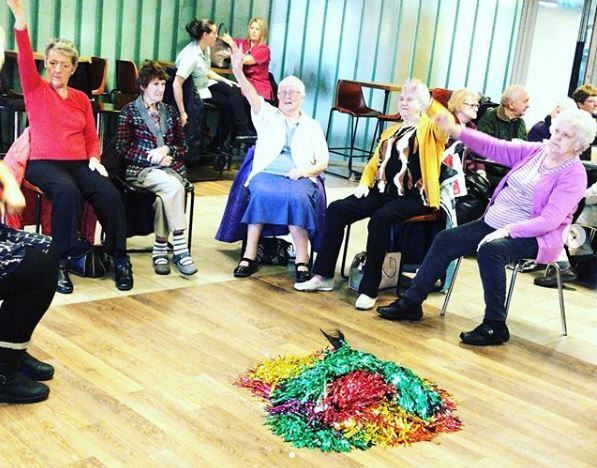 This was a pilot project and Kirklees worked in partnership with The John Smith’s Stadium and with more than 10 nursing care homes to establish if there was a need for a movement and dance in chairs class. After many free taster sessions within care homes it was soon established there was a demand for this specialist provision. During the afternoon residents from varying different care homes arrived in mini buses and taxis. All eager to take part. Residents took part in a teacher led session with sensory, visual, noisy and tactile resources. The main component was performed with the popular elastic band which allowed the residents to ease into their desired movements and to be able to take part at their level and ability. Musicality could be heard throughout The Legends Café Bar and with staff singing and joining in too. It was a great inclusive atmosphere and everyone was buzzing, there was laughter, joy, happiness, singing and lots of movements to choose from. The next free class takes place on Monday April 1st 2-4pm (please note this class is a free class). Hope you can make it. This class is held the first Monday of each month only.